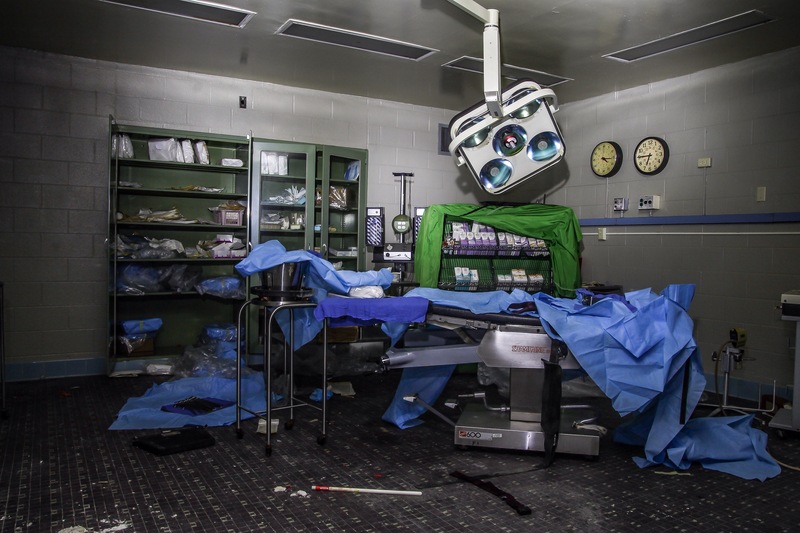 A wave of rural hospital closures swept throughout the Southeast in the early 2000s. Georgia suffered from 9 hospital closures in less than 10 years. One of the first to shut down was Bad Debt Hospital in 2001. Built in 1968, the 52-bed one-story hospital included an emergency room and intensive care units employing 150 staff members. A few years after opening, a corruption scandal engulfed the local county government. The hospital was headed for financial trouble, abruptly closing down in 1974 due to funding issues. Community leaders banded together and formed the Hospital Corporation., a nonprofit organization that would lease the hospital from the County Authority and run the daily operations. Watch your step! Old syringes litter the hospital grounds. Bad Debt Hospital reopened in Spring 1985. However by the early 1990s, the threat of closing again loomed overhead. The Hospital Corporation was close to $1 million in debt and looked to Quorum, a hospital-management company, to bring in a CEO to help avoid another shutdown. Unable to make payroll the Hospital Corporation looked to the County Commission for immediate assistance. The County Commission set aside $1.7 million to help with the short term debt and assist the Hospital Corporation. Quorum instantly restructured all the old debts, replaced 2 popular doctors, and cut 40 staff members in an effort to save money. Problems once again arose in 1995, when the Hospital Authority began to question the Hospital Corporation about the dwindling funds in a reserve account. Quorum didn’t respond to requests of the hospital’s finances. This caused a rift with the County Authority and Hospital Corporation since the Authority was not allowed to sit in on board meetings with Quorum. The County Hospital Authority decided they needed to watch more closely for screw ups and mismanagement. 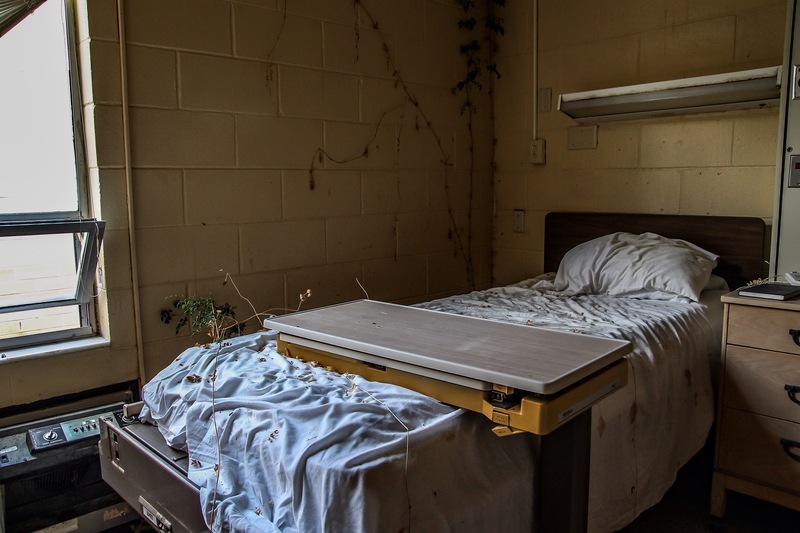 Patient rooms were intact, 15 years after the hospital closed. 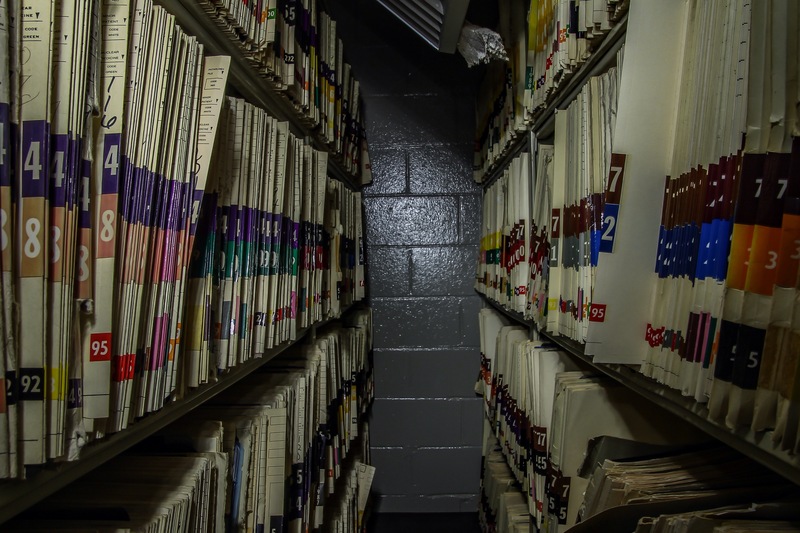 Hundreds of patient records were left stacked in one office. 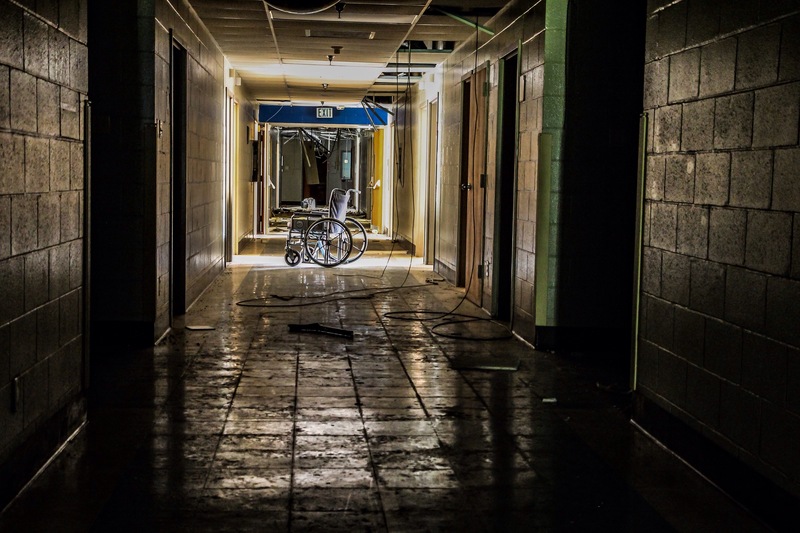 The long, dark hallways were mostly lit from windows in patient rooms. The County Hospital Authority found that Hospital Corporation was not carrying enough insurance for the emergency room doctors. In 1998, escorted by the lawyers and the sheriff, the County Hospital Authority stormed in to the CEO’s corner office and demanded his resignation. The CEO packed up and left without a fight. 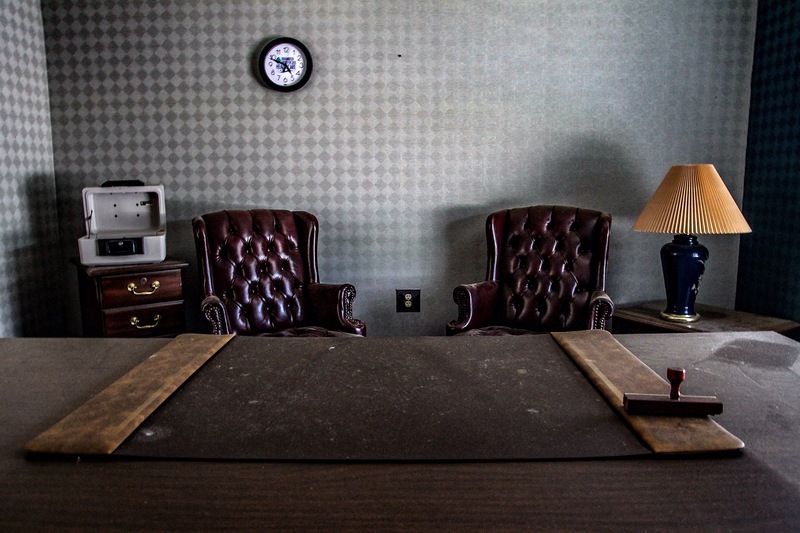 The office of the CEO remains eerily untouched since the hospital’s closure. A year later, cuts to Medicaid funding were the final nail in the coffin. A series of layoffs followed, culminating in the facility’s closure by the end of 2001. The county was largely supported by the textile industry until the companies moved to Mexico. Other industrial employers wouldn’t come to the county due to the high cost of insurance. Without a local hospital, future industrial expansion in the county stifled. Employers would not commit to building a new factory without a hospital nearby due to high insurance costs. After Bad Debt Hospital closed, vandals broke in looking for leftover medication. They ransacked the place and stole copper wiring instead. 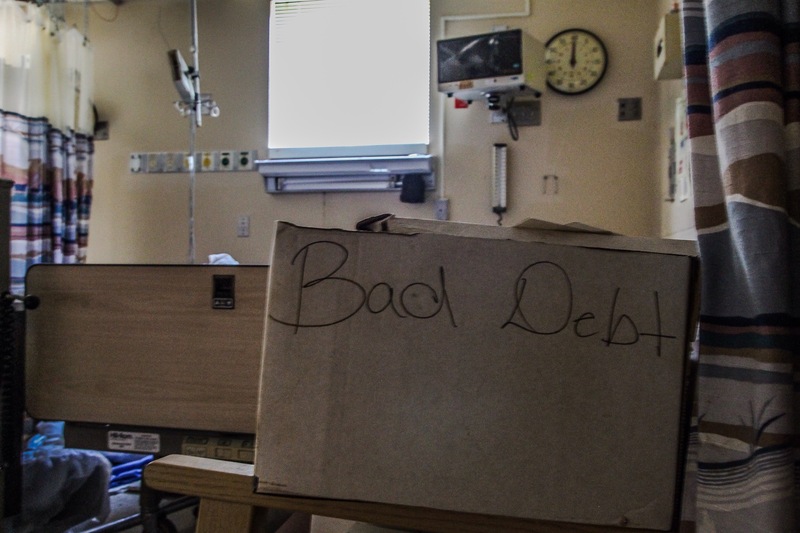 Boxes labeled ‘Bad Debt’ including bills and letters from the IRS were stacked in patient rooms. County officials attempted to create a more cost-effective clinic to replace Bad Debt Hospital but state laws would not allow funding. After Bad Debt closed, the closest hospital was 90 minutes away. Ambulance companies charged outrageous per mile fees not covered by insurance. The county’s heart attack death rate rose 40 percent without a local hospital. Today, the hospital remains abandoned. 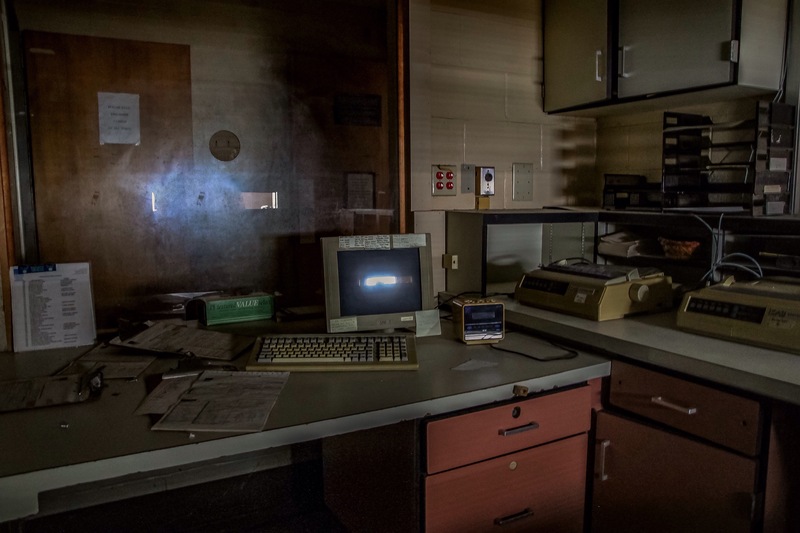 After the closure, nobody ever returned to remove the equipment or electronics. These items, along with tons of patient records, remained entombed inside the hospital. The County Hospital Authority still owns the facility and hopes to one day reopen. the photographs speak so much more..!! 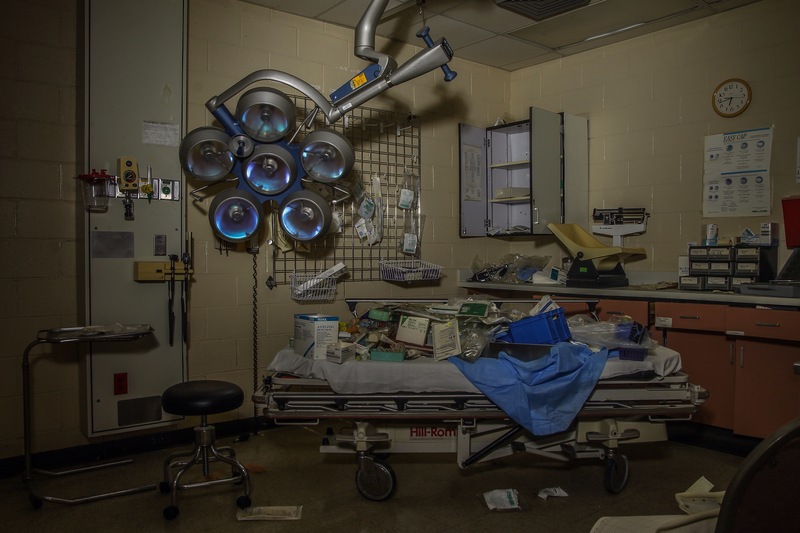 It amazes me every single time, when I see a place like this, that there is no law that says patient records must be kept secure somewhere or destroyed. Another top class story. Many states do have such laws, but they’re not frequently enforced. Hard to impose penalties on a defunct organization. really eerie love the idea of the blog! Stunning pictures! Its funny how there are so many video games out now with this very same environment setting. Keep up the good work! Wow, you have some great pictures here! Thank-you so much for not naming this hospital and it’s location!